In 1971, David Bowie asked a question that had also been pondered by decades' worth of scientists and pseudo-scientists and regular old dreamers who gazed up into the sky and wondered who, and might, be up there. "Is there life on Mars?" Today, we have an answer. And it's one that will -- if you are one of those dreamers who wanted the answer to be yes -- come as a crushing disappointment. The answer is ... no. Or, well, the answer is probably most definitely not. And that's because Mars, it seems, has no methane. Or, at least, the Curiosity rover that's been tooling around the surface of the Red Planet for more than a year, taking measurements of the air and the soil, has found no methane. And that means, essentially, that life as we know it does not -- cannot -- exist on the planet. Methane is the byproduct of microbial respiration; no methane, basically, no microbes. “It just isn’t there,” Dr. Sushil K. Atreya, a member of Curiosity's science team, told The New York Times. 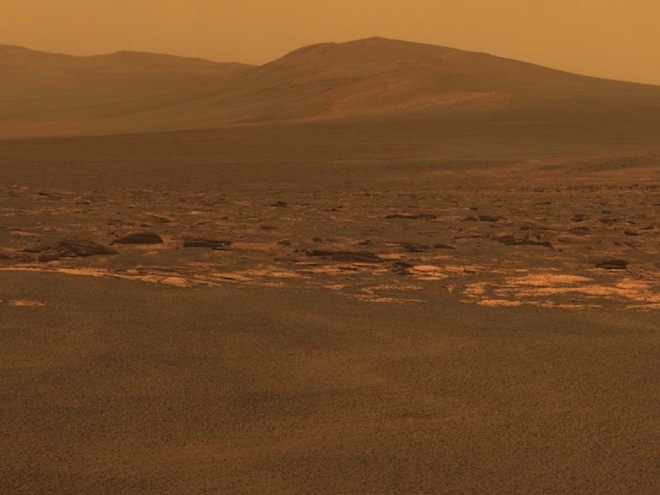 John Grotzinger, the project scientist for the Curiosity mission, conceded that the findings do "diminish the argument that there are methanogenic organisms there." The news "discounts," he said -- though it doesn't fully refute -- the idea that there could be life on Mars. It's a big planet. A paper published today in the journal Science broke the news. And it offers a seeming refutation of an earlier finding: A decade ago, telescopes detected what seemed to be plumes of methane rising from certain regions of Mars -- which gave rise to speculation about life on the Red Planet. With today's findings, though, the idea of life on Mars -- life happening now, in the nooks and crannies of our neighbor planet -- has been returned to a question of speculation. Which is disappointing for the many scientists who invested so much into answering the life-on-Mars question -- and to the many non-scientists who prefer to think of Earth as unexceptional. But today's news is also, of course, a reminder of how interplanetary science works. When your laboratory is another planet, discovery is adventurous, and expensive, and occasionally disappointing. You strive and strive and search and search, and sometimes you don't find the thing you were looking for. Sometimes, the thing you were looking for turns out not to be a thing at all.